Target’s got a great freebie for you right now. 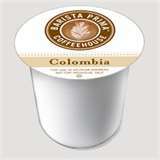 Barista Prima Coffeehouse K-Cup varieties! Just take this quick survey about your coffee habits to see if you qualify. Limit 1 per household. Please allow 4-6 for delivery. My last Target sample was a free product coupon, so I’m expecting this to be one too.